After a careful evaluation of your home’s value, what’s left of your mortgage, and your specific financial situation, some home owner’s in today’s Chicago real estate market are faced with selling their home or condo as a short sale listing. In real estate, a short sale is an agreement between the home owner and lender to sell the home or condo for less than the balance of debts against the property. The main objective of most short sale transactions in Chicago is to avoid foreclosure; however, not all lenders will accept such an agreement, especially if foreclosure would, in fact, make more financial sense. 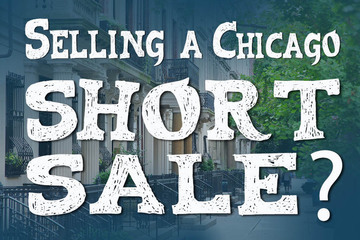 There’s no doubt that selling your Chicago home as a short sale can get tricky. Finding the right real estate agent with ample short sale experience in Illinois will go a long way towards achieving short sale success. The right Realtor can assist in finding the true value of your Chicago home or condo, determine the right listing price for your home once it’s placed on the Chicago real estate market, and guide you through the negotiation process between you, potential buyers, and of course, the home lender involved in your Chicago short sale transaction. SEE WHAT PREVIOUS CLIENTS ARE SAYING! Thinking about hiring The Guarnero Group to sell your Chicago home or condo? See what our previous clients have said about their experience working with our team of home selling experts! All three of the above factors are critical throughout the selling of a Chicago short sale. But perhaps the worst mistake home owners can make when trying to sell their Chicago home as a short sale is to use an agent with poor marketing skills. Some inexperienced real estate agents in Chicago will tell you that pricing along will sell a short sale, and they encourage clients to set a very low listing price. However, with a short sale, the listing price of the home is usually much more critical and the home needs to be properly listed now more than ever. Not only does the price have to be right among potential home buyers, but it also has to be approved by the lender. Pricing the home right and paying an equal amount of attention to short sale listings as other Chicago home listings is what will ultimately get your Chicago short sale sold. And with the marketing plan Ted Guarnero has at the SeeChicagoRealEstate.com Network, don’t let choosing the right real estate agent make selling your Chicago home as a short sale more complicated than it needs to be. For more information on selling your Chicago short sale or to learn more about the short sale process in Chicago, contact Ted Guarnero at (312) 810-6693. HAVE A LISTING EXPERT GET IN TOUCH WITH YOU TODAY! Note: Your phone number is your password Yes, allow me access to all active MLS listings on your site.